The 2017 Keach Conference was held Friday-Saturday, September 29-30 at Covenant RBC in Warrenton, Va. I was given the task again this year of a giving an "orientation" to our meeting at the start of the conference. Here are my notes from this year's orientation. Greetings in the name of our Lord Jesus Christ, the Great Shepherd of the Sheep. I am Jeff Riddle, pastor of Christ Reformed Baptist Church in Louisa, Virginia, and I have been given the task again this year of extending a warm welcome to you on behalf of the Reformed Baptist Fellowship of Virginia and of offering an orientation to the annual Keach Conference. This is the sixteenth consecutive fall season in which a group of believers, church members and officers, from various congregations across the Old Dominion and beyond, have gathered to enjoy edifying fellowship and conversation and to hear concentrated doctrinal teaching and preaching on the most precious faith “once delivered unto the saints” (Jude 3). During these years we have met in various locations across the commonwealth, from Virginia Beach (FBC, Virginia Beach, in our first meeting), to Northern Virginia (Good News Baptist Church, Alexandria), to Richmond (All Saints Presbyterian Church), to Harrisonburg (Providence BC, last year). Our meetings have included various participants over the years. Some have attended only once or twice. Others have become regular fixtures. Some have never been able to attend in person but have faithfully listened to the messages online (last year’s messages alone have received around a thousand collective downloads). In the early years, we called our gathering the “Evangelical Forum,” reflecting our desire to rekindle interest in the Biblical evangelion, or gospel. Eventually, our interest became more defined as we moved from focus on soteriological Calvinism to a more full-orbed, Reformed, confessional Christianity. One evidence of this shift (one might even call it growth or maturity) is the fact that eleven years ago (in 2007) we decided to make the theme of our conference a consecutive chapter by chapter study of the Second London Baptist Confession of Faith (1689). Thus, last year our conference theme was “Of Effectual Calling” (chapter ten). Another evidence of this shift, was the fact that we changed the name of the conference in 2010 from “Evangelical Forum” to the “Keach Conference,” calling the meeting after the influential English Particular Baptist minister Benjamin Keach (1640-1704), a man who had suffered public pillory for his preaching of credo-baptism, one of those present at the assembly which adopted the Second London Baptist Confession, and the only Baptist whose profile was included in Joel Beeke and Randal J. Pederson’s book Meet the Puritans. We have been blessed over the years with some outstanding and gifted speakers who have agree to come to our humble gathering, often at little compensation other than covering their travel costs. This has included men like Greg Barkman (Scripture; Beacon Baptist Church), Joseph Pipa (God; Greenville Presbyterian Seminary), Derek Thomas (God’s decree; then at Reformed Theological Seminary in Jackson, Miss), David Murray (Creation, Puritan Theological Seminary); Joel Beeke (Providence, Puritan Theological Seminary), Malcolm Watts (Providence, Emmanuel Church, Salisbury, England), and Jim Savastio (Of Christ the Mediator, RBC-Louisville), to name but a few. We have also been blessed to hear gifted pastors from Virginia, including Lloyd Sprinkle, Bryan Wheeler, and Steve Clevenger (again, just to mention a few). With regard to respected and able speakers, this year’s conference is no exception as we welcome Pastor Poh Boon Sing of the Damansara RBC of Kuala Lampur, Malaysia, along with his wife Goody. Pastor Poh will be introduced later, but let me say something about our speaker at this point, if I may. In 2015 I had the privilege of visiting Pastor Poh, staying in his home, located above the church meeting hall, and speaking in an annual theology conference hosted by his church for Reformed ministers and local church members (we might call it their “Keach Conference”). Delegates attended from various places in southeast Asia and beyond (from Malaysia, Nepal, Myanmar, Indonesia, Singapore, Hong Kong, and Pakistan). In that visit, I got to see first-hand the ongoing ministry and fruit of Pastor Poh’s labors within his own church and beyond, where he serves as a sort of Baptist “bishop” (I know that’s not part of our ecclesiology; ok, let’s call it “mentor”). I saw and heard, in particular, the wide range of Pastor Poh’s labors in the vineyard, as I watched him move, with ease and competence, from capably explaining complicated doctrinal topics to eager theological students, to preaching the simple gospel to scores of Nepali migrant workers, gathered in a single crowded room (we would call it a “flop-house”) or to Indonesian construction workers living in what we would call make-shift slums. Pastor Poh is, in fact, a recognized expert in the field of both English Particular Baptist historical theology and in Reformed Baptist ecclesiology, the doctrine of the church. We are honored to have him here. According to our previously adopted thematic plan, this year we would have been looking at chapter 11, Of Justification. This certainly might have been very fitting given that this year marks the 500th anniversary of the Protestant Reformation (October 31, 1517-2017). When we discovered that we might be able to have Pastor Poh come to speak at the conference this year, however, we decided that though we might have had him address chapter 11, it would only be fitting if we skipped ahead to chapter 26, Of the church. Rest assured, next year we will return to chapter 11. We look forward to this opportunity to listen to and learn from a man who has given much time and attention to this topic. Second, let me suggest a change. If you have read Pastor Poh’s important 2013 study A Garden Enclosed: A historical study and evaluation of the form of church government practiced by Particular Baptists in the 17th and 18th centuries, you know that he suggests that Benjamin Keach and, later, John Gill were primarily responsible for what he believes to be an infelicitous departure from the Independent church government model of John Owen which had been adopted by the first generation of Reformed (Particular) Baptists. According to Poh, Keach was only a “second generation leader” (A Garden Enclosed, p. 126), a “controversial figure” (p. 168), who relished being “engaged in all controversies” (p. 176). He was “a prickly, rash, and independent-minded personality” (p. 176). He held to a “mixed theology” and often straddled the line between the General and Particular Baptists, on various issues (p. 206). Among Particular Baptists, he was a “virtual loner” (p. 220). 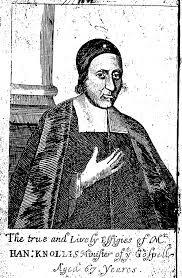 Poh’s hero, on the other hand, is Hanserd Knollys [pronounced Knowles] (1599-1691), one of the few early Baptist pastors with a university education. He suggests that Knollys was “most influential among the Particular Baptists,” and he can even speak of his influence as “the Knollys’ factor” (p. 180). He further suggests that Knollys’ influence has been unjustly downplayed by more recent Baptist historians. In truth, Poh argues, “[William] Kiffin was the Hermes and Knollys the Zeus of the Particular Baptist community” (p. 183). Of the three so-called “mighty men” among early Baptists (Knollys, Kiffin, and Keach), “Knollys was chief of the three” (p. 183). In light of these convictions and in deference to our speaker, I suggest that we refer to our 2017 conference as the Knollys conference, rather than the Keach Conference (but that, for the sake of consistency, we go back to Keach next year). So, welcome to the 2017 Knollys conference! May the Lord richly bless and encourage us as we meet together and learn about his church, which he himself founded upon Peter’s confession, “You are the Christ!” and against which, as Christ has promised, the gates of hell shall not prevail.